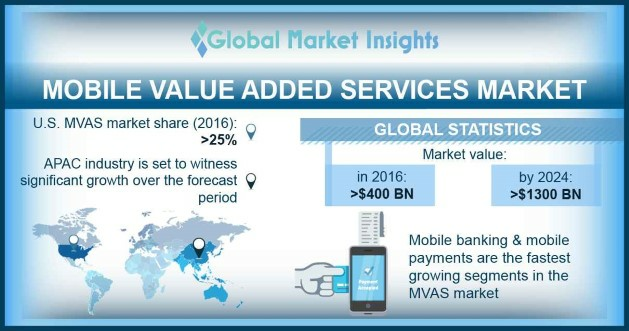 (MVAS) Mobile Value Added Services Market size was over USD 400 billion in 2016. Increasing penetration of smartphones & tablets, fixed broadband subscriptions and the number of active mobile broadband services are some of the factors driving the MVAS market globally. Currently, mobile phones have transcended from being a device used for playing music, text messaging, or voice calling, to a powerful utility and infotainment tool. From finding the nearest restaurant, paying bills, to receiving the up-to-date stock updates, the potential of mobile phones is seemingly boundless. Steep increase in the usage of social networking apps and mobile payments is helping support the MVAS market size. Furthermore, rich communication services are expected to offer several opportunities to the industry stakeholders. Rising demand for entertainment services on mobile handsets is also a key trend being witnessed in the MVAS market, thereby resulting into the development of key opportunities in on-demand music & video content, live TV shows & events and localized vernacular content. The entertainment services mainly consist of caller tunes, SMS based contests, and subscription based alerts. With the decline in smartphone prices and the launch of LTE services, customers demand innovative and advanced forms of entertainment services. The mobile banking and mobile payments market are the fastest growing segments in the industry. Presence of factors such as high speed networks and tariff charges act as the key growth drivers. Services such as mobile wallet, mobile remittance and business correspondence are expected to provide major opportunities for mobile money industry growth. The industry has witnessed a rapid shift in customer preference from enriched to transformational services. The gap between the basic nature of existing VAS and the customer interest in advanced data services today shows that there is substantial untapped potential for industry growth. The current mobile value added services market landscape only skims the surface of customer requirements. With the rapid rise in media consumption in digital formats, an increase in the number of mobile devices which can support digital media with high LTE speeds is propelling the MVAS market size across the globe. It has offered customers an opportunity to access the media content of choice anytime, anywhere. Health and IT coupled with the usage of electronic health records offer some exciting possibilities and have great potential to transform the healthcare system into an improved patient centered system. With the introduction of LTE services such as 3G and 4G, the possibilities of remote treatment and patient diagnosis through mobile phones have strengthened, driving the MVAS market growth. Telecom operators and VAS providers have been considering usage of mobile phones for diagnostic & treatment support, remote disease monitoring, communication and heath awareness. The U.S. MVAS market share was over 25% of the global revenue in 2016. Media consumption in the country has shown a rapid increase and has seen an important jump from legacy media to new digital media. Rise of digital media players such as Amazon, Apple TV, Boxee, Hulu, Netflix, and Roku, are stimulating the authority of the TV as the main entertainment hub. In Latin America, development of the MVAS market will be mainly driven by the operators expanding network coverage to underserved and unserved regions, officials employing pro-competition policies, such as the easing of the entry of MVNOs and new operators, and the interest of cellular IoT/M2M. In addition, enterprises in Latin America will expand their IT budgets for MVAS, thereby offering a huge prospect for MNOs and tech vendors. Companies in the mobile value added services market include Alibaba Group Holdings Limited, Apple, Inc., AT&T, Inc., Gemalto N.V., Google Inc., KongZhong Corporation and Vodafone PLC. Owing to the fragmented nature of the industry, players are concentrating on expanding their services and increasing acquisitions to gain share. For instance, in November 2015, Apple, Inc. announced that it acquired Faceshift, a Switzerland-based company which has developed an innovative technology to capture person’s facial expressions in real time and create animated avatars. With this acquisition, Apple plans to offer a framework which can allow developers to integrate Face shift features into their videos & games. The MVAS market is offering several opportunities for application developers, network operators, mobile handset manufacturers, and other vendors to produce revenue, satisfy customer requirement and spread customer influence. These solutions have enabled network operators with a precise client base to spread its market reach and intensify its business revenue. Benefiting from the development prospects and addressing the essential encounters entails a complete and in-depth understanding of the growth trajectory for the stakeholders, together with problems pursuing them and ways of enhancing solutions.